Since an interface is a reference type, it can be used in the same way we have used instantiated objects from classes. If the interface is use in this way, all the method will need to be implemented inline or anonymously. Here is how we could have used the Listener interface to receive a message that we have connected to the chat server in the chat program. Notice the semicolon, ; at the end since this is a statement declaration. 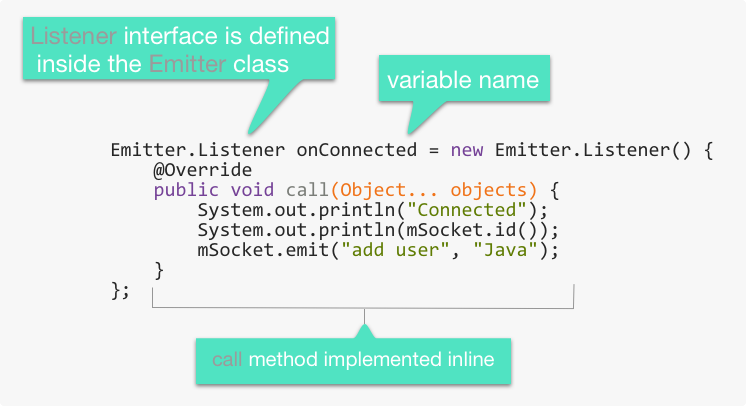 This is why we are able to pass in the onConnected variable since its of type Listener. If we are not going to use the interface variable in other place we can implement the interface anonymously. We can pass the interface body right in as a parameter and provide the method bodies inline.